Welcome to UMC Maternity Department! 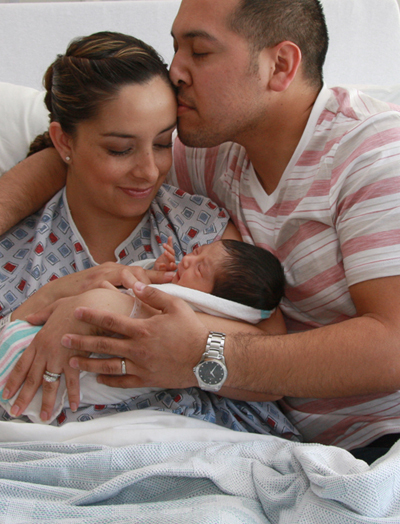 UMC features El Paso’s first and only Hospital just for women and babies. It features 56 all-private rooms which include spacious antepartum suites for high-risk pregnancies, Labor, Delivery & Recovery suites and postpartum rooms on our Mother/Baby Unit. A major component of the facility is the state-of-the-art equipment and technology in our operating rooms and a special 30 all-private room Women’s Surgical Health Unit for women who have undergone gynecologic surgery. UMC is dedicated to women’s health, that is why our Maternity Department is staffed by world-class physicians, and specially trained registered nurses. UMC is affiliated with the Texas Tech University Health Sciences Center Paul L. Foster School of Medicine, which allows around-the-clock care by physician specialists who are highly-trained and in-house 24/7. A cadre of private practice physicians also practice medicine on the UMC/Texas Tech campus. We are committed to providing the highest level of care to women and newborns and we pride ourselves in following the Family/Patient-Centered Care Model. This care model encourages patient and family involvement in the delivery process, opens lines of communication between healthcare providers and patients and creates learning opportunities, all of which are proven to lead to good outcomes and family satisfaction. Our patients’ healthcare is our number one priority. Our Family/Patient-Centered Care Model allows our healthcare team to create a close relationship with each patient and their family, all of whom are involved in their healthcare treatment decisions.